COMPANIES eyeing China can expect new investment opportunities and a more relaxed foreign investment environment there soon. 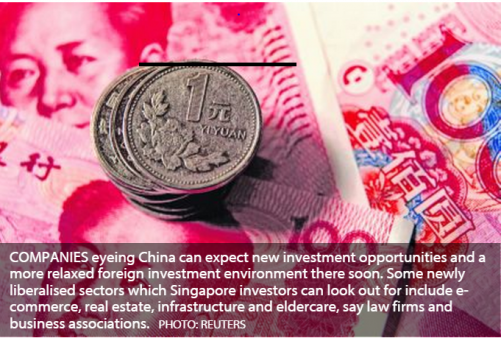 Some newly liberalised sectors which Singapore investors can look out for include e-commerce, real estate, infrastructure and eldercare, say law firms and business associations. From April 10, China will lift some restrictions on foreign investment when its Foreign Investment Guidance Catalogue (2015 Amendment) comes into force, repealing the 2011 Catalogue. For one, the new version eases the foreign ownership limitations for industries including e-commerce and subway construction. Also, industries in China are classified as "encouraged", "permitted", "restricted" and "prohibited" (in terms of foreign investors' access to them) and the number of restricted industries in the new Catalogue will more than halve from 80 to 38, while the number of prohibited industries will fall from 39 to 36. Foreigners in the newly encouraged or permitted sectors will no longer face greater scrutiny or need to be approved by a higher authority, which often takes longer. The key industries to be recategorised from "restricted" to "permitted" are: e-commerce; transportation of goods by rail; construction and development of power grids; and construction and operation of high-class hotels, high-class office buildings and international exhibition centres. Also, industries including the operation of golf courses and villas will be recategorised from "prohibited" to "permitted". The new Catalogue presents investment opportunities to not just large corporates and government- linked companies, but also small and medium-sized enterprises (SMEs), said Joseph He, joint head of WongPartnership's (WongP) China practice. Kurt Wee, president of the Association of Small and Medium Enterprises (ASME), said Singapore SMEs are in a good position to plant a stake in China, although they "must be tough, nimble and alert", as they may face challenges such as red tape and intellectual property protection. Among the newly liberalised sectors, WongP expects its Singapore clients to be most keen on real estate, power, transport and e-commerce. E-commerce is one particularly popular sector. All those whom The Business Times spoke to said the reclassifying of e-commerce from "restricted" to "permitted" bodes well for both large and small players here. Mr Wee said the liberalisation of e-commerce segments will lower the barriers to entry for Singapore SMEs. Given China's vibrant domestic e-commerce market, the sector is "very hot" now, with online shopping and related industries such as logistics among Singapore companies' best bets, WongP's Mr He said. Moreover, under the new Catalogue, the 50 per cent cap on foreign capital will be removed for e-commerce. This means foreign investors can soon hold a majority stake in Chinese e-commerce companies, said Chia Kim Huat, regional head of corporate and transactional practice at Rajah & Tann Singapore LLP. "In the same vein, the construction of data centres and back offices is also encouraged," Mr Chia said. As for real estate, land development and the construction and operation of high-class hotels, office buildings and exhibition centres will be attractive industries, according to the Singapore Chinese Chamber of Commerce & Industry (SCCCI), WongP and Drew & Napier LLC. "These are areas which Singapore companies are competitive in," SCCCI president Thomas Chua said. However, Wu Geng, deputy head of Drew & Napier LLC's Greater China Group, pointed out that there remain other restrictions in real estate. For instance, foreigners cannot directly own properties in China. Also, real estate in China may not suit smaller investors, as getting financing has become a significant challenge, cautioned Eric Lian, president and chief executive of UOB (China). "Unless you're big and have a local partner, you will face headwinds," Mr Lian said. Currently, the cost of borrowing is high and most banks have quotas for real estate projects, he said. Many second and third-tier real estate companies are already facing a liquidity squeeze in China. So it will not be easy for Singapore companies to go in and compete. The new Catalogue will also allow SMEs to tap China's ageing population, said Mr Chia from Rajah & Tann. The development of eldercare facilities and nursing homes will be added to the list of "encouraged" industries. So Singapore SMEs in that space will get the chance to expand to China, he said. Investors in encouraged industries tend to receive preferential treatment, get approval faster, and can discuss their requirements with the Chinese government. With all that said, however, the new Catalogue is not all good news. The education sector and some professional services can expect some tightening, Mr Chia said. The previously permitted industries of preschool and tertiary education will move into the "restricted" category, he said, while legal services will be added to the "prohibited" category. The new Catalogue is also not without its caveats, said Gerry Gan, joint head of WongP's China practice. "Bear in mind that when China opens something up, in our experience, something might be encouraged or permitted on paper, but at the point of approval, there might be practical difficulties," Mr Gan said.